Many were shocked to see what President Trump did after eating at a steakhouse in his Washington, D.C., Trump Hotel. President Donald Trump made reservations for a private dinner at the BLT Steakhouse in his Trump Hotel in Washington, D.C., and did so without inviting any of the press. However, after a source revealed this information to the Independent Journal Review's Benny Johnson, he quickly made his own reservations to see what he could learn from the dinner. After Johnson arrived at the steakhouse at around 6 p.m., he watched Secret Service search the area and make sure everything was clear for the president's arrival. Finally, after more than two hours, the president arrived. 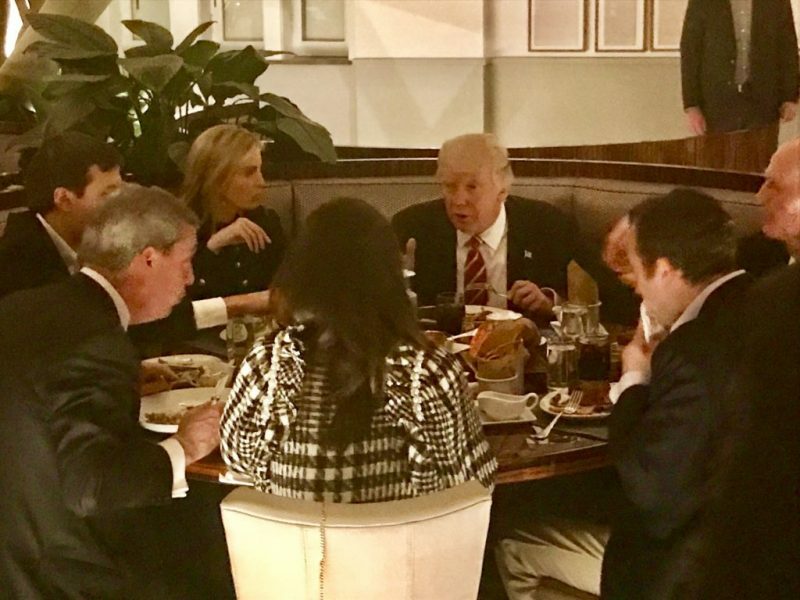 Trump ate dinner with a group of guests, including Secretary of State Rex Tillerson and the UK's Nigel Farage. Johnson reports that Trump picked up the tab for the whole table, but what happened next surprised many. At the end of the dinner, Trump walked over to the busboy who took care of the table and slipped something into his hand - a $100 bill. According to Mad World News, Trump then took some time to talk to other guests at the restaurant, sign autographs, and take pictures. A chant of "USA" even reportedly broke out at one point while President Trump left the building. A waiter provided more details about Trump's meal to the Independent Journal Review. "The President ordered a well-done steak. An aged New York strip. He ate it with catsup as he always does," the waiter, who wishes to remain anonymous, revealed. "The sides and appetizers on the table were shared. Three jumbo shrimp cocktails were delivered before the meal. At one point, the President looked at his watch and remarked, 'They are filming Saturday Night Live right now. Can't wait to see what they are gonna do to me this week.' It was hard to serve him because he is so funny and relaxes, makes you laugh." Johnson says that he spoke to Nigel Farage at the end of the dinner and asked what it is like to have the President of the United States take you out to dinner. "Well it's really quite wonderful," Farage replied. 'But as I've gotten to know Donald, it really just does not surprise me. You know what amazes me about your President? He is a regular bloke. Truly. Just a normal chap. Upstairs at dinner, he spoke to the table like any regular guy out to dine with friends and family. There is no pretension at all."